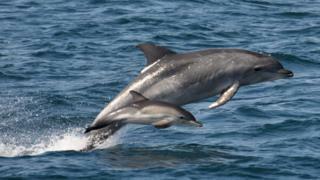 A long-awaited plan for managing Wales’ seas could have “significant negative consequences” for marine wildlife, environment groups have warned. Assembly members are set to debate the draft Welsh national marine plan on Tuesday afternoon. Almost a decade in the making, it sets out how seas should be used and protected over the next 20 years. The Welsh Government said it was aiming for “clean, healthy, safe, productive and biologically diverse seas”. Clare Reed from the Marine Conservation Society said the plan needed to do more to demonstrate how it intends to protect wildlife. RSPB Cymru said it was “shocked” by elements of the plan, which it described as “deeply worrying”. Director Katie-Jo Luxton said some of the policies outlined in the document threatened to undo the Welsh Government’s own commitments to nature and sustainable development. Support for a number of tidal lagoon energy schemes along the Welsh coast “with very limited caveats” was the worst example, she said. Alec Taylor, programme manager for marine governance at WWF UK, said the charity welcomed the efforts made. The Welsh marine plan area consists of about 12,350 sq miles (32,000 sq km) of sea, as well as 1,300 miles (2,120km) of coastline. The draft plan is the first of its kind in Wales and is designed to be used by those making planning decisions that could affect the coastline and seas. Traditionally, the needs of different sectors that use the sea, such as fishing, tourism or energy generation, have been managed separately but this tries to bring them together. It talks of balancing the need to protect a healthy and resilient marine environment while also using it to create jobs and boost the economy. Welsh seas could make “a strong contribution”, it argues, to energy security and climate change emissions targets through the deployment of low-carbon power generators. Once the plan has been adopted, Welsh ministers will have to report on the extent to which its objectives are being achieved. A public consultation has been launched for people to give their views on the draft before it is finalised. Cabinet secretary for energy, planning and rural affairs, Lesley Griffiths, said: “In Wales, tourism, transport, marine energy, fisheries, aquaculture, telecommunications and aggregates industries amongst many others are vitally important for our maritime economy.